AI technology is able to detect melanoma more successfully than the naked eye. Here’s how a Bondi Beach activation generated exposure for the technology. Agencies: GPJ Australia – experiential, Ogilvy Australia – brand strategy, Text100 – PR. If Australia and New Zealand had a national cancer, it would be melanoma. Blame the climate, our lifestyle or the hole in the ozone layer, but it feels like it’s everywhere: almost everyone seems to know someone touched by melanoma. More than 13,000 Australians will be diagnosed this year, with one Australian dying from it every six hours. It doesn’t discriminate, affecting men, women, different races, skin types, the elderly, even teens. It is one of Australia’s deadliest cancers – but is also the easiest to beat cancer when caught early. The survival rate is over 98%, but detection is critical. IBM’s cutting edge AI (artificial intelligence), Watson, can understand natural language, self-learn, reason, interact and process data in more detail than any human could in a lifetime. Currently clinicians can successfully detect melanoma at about 60% with the naked eye. That improves to more than 80% through dermoscopy. The target for IBM Watson? 91% accuracy. The more data Watson has, the easier and more accurate melanoma detection can become. The objective was to make Watson real to people – to show Watson in a tangible way relevant to all Australians and showcase how its technology is being used today to help save lives. Choosing melanoma allowed IBM to tackle an issue most Australians can relate to. The aim was to activate in Bondi Beach during the peak season, allowing just two months to plan the entire activation. 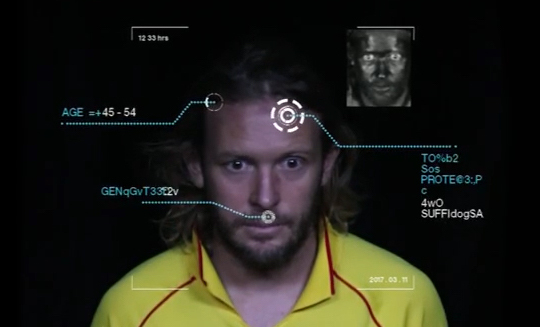 Watson can detect melanoma with 31% more accuracy than the naked eye. That 31% can literally mean life versus death. But Watson needs data – the more it knows, the more accurate it can be. That data can be learned from simple, natural interactions. We asked Australians to tell Watson their melanoma story at our Bondi Beach activation, which used IBM Smart Mirrors to collect data from the public on this disease. Simply by standing in front of the mirror, everyday Australians were analysed by Watson – determining their age, gender and sunscreen coverage. Where Watson detected a risk, the person was referred to an on-site skin specialist. They conducted a visual analysis and took high-resolution images of any concerning moles for further analysis by a specialist dermatologist. This followed an integrated media campaign, which included video, display, print and radio call-outs that encouraged the audience to participate by providing data via social channels. 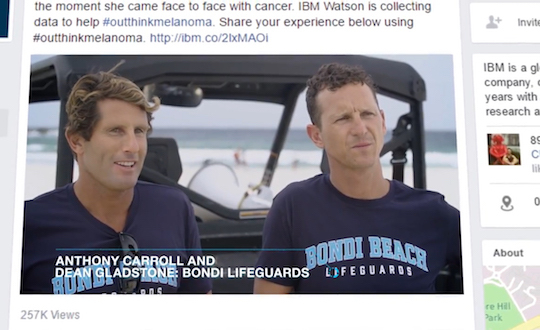 Over a weekend in March, George P Johnson Australia (GPJ) helped IBM take over Australia’s iconic Bondi Beach with an activation using newly invented Watson Smart Mirrors to collect data from the public on this insidious disease, and ultimately help us all Outthink Melanoma. Beachgoers, surfers, lifesavers and even Sunday Nippers attended over the two days. 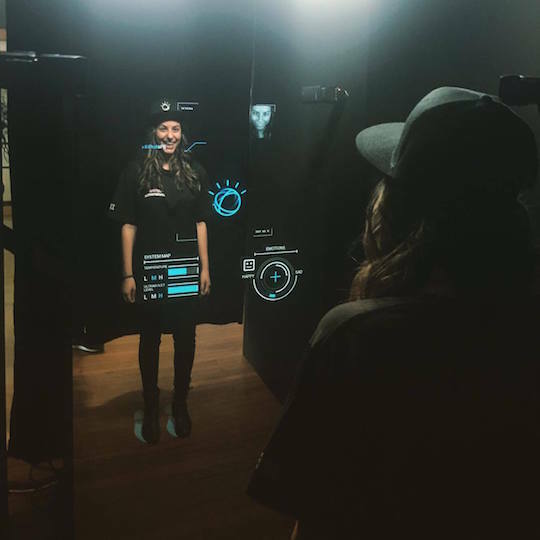 Hundreds of people talked with IBM Watson through a smart mirror that extracted key information including their age range, gender and even if they were wearing sunscreen. This data was combined with weather information to determine the person’s risk of sunburn against the UV rating at the time of day. The de-identified data gathered from the assessments and checks will contribute to IBM research, in association with Melanoma Institute Australia and Molemap, to teach Watson to detect melanoma. To rally Australians behind this great cause, a robust social media campaign urged those affected to share their melanoma stories on social media. By participants using the hashtag #outthinkmelanoma, Watson could analyse and learn more about the disease. The campaign shared survival stories of Australian celebrities on social media and earned ongoing and real-time social media engagement at the event. The celebrities who got on board included Olympic Gold Medal swimmer Mack Horton, TV host Deborah Hutton and Bondi Rescue lifeguards ‘Deano’, ‘Harries’ and ‘Kerrbox’. This campaign was conceived and created with the ultimate goal of saving the lives of Australians. Through this activation, more than 800 Australians had their skin checked, with Watson referring 22% to a follow-up skin check, with a further 40% then referred to a dermatologist for further diagnosis. More than 800 people were helped by Watson during a single weekend, with millions of others exposed to the message of staying safe and checking their skin regularly. All four national TV broadcasters covered the story. Channel 9’s Weekend Today story was the show’s highest rating segment: 300,000-plus viewers, the most watched program that morning overall and in the biggest markets: Sydney, Melbourne and Brisbane. Media coverage generated five million impressions, more than 20 percent of Australia’s population. Six in-depth radio interviews were conducted, including with the ABC – which doesn’t take commercials. Both of Australia’s national newspapers published articles; with the Australian Financial Review running it on page three – reaching our C-Suite and wider audience.